I LOVE Lush products. I like their masks but never manage to try their facial cleansers. So imagine my delight when I received this! At first, I was confused about how this works. Is this a normal face cleanser or a makeup remover? So after much research, I finally realised this can be both. The first thing I notice was the smell. If you are not a fan of sweet, floral smell, this is probably not for you. It is quite strong and it takes quite a bit of to get use to it. But I know of some people who can get headaches just by the scent. I saw a few reviews online that mentioned they used this as a makeup remover because it is gentle for the eyes. So I tried that first, with the cotton pad and nope, it doesn't sting your eyes at all. It removes my matte lipstick and foundation perfectly but it is a little tough when it comes to my waterproof mascara. It definitely takes more than a few wipes but it WILL remove it eventually. After that, I used it as a normal cleanser to wash off the leftover dirt on my face. So this is my new night facial cleanser. In the morning, I just use my usual Enzyme Cleansing Gel from Mario Badescu. So how does it feel after using this? My face feels clean and refreshed after a long day. I was expecting some breakouts but apparently it is perfect for sensitive skin as well. So yay to that! As for the price, it is $18 for a 95g and $33.50 for 240g. So, it is not too expensive, to be honest. 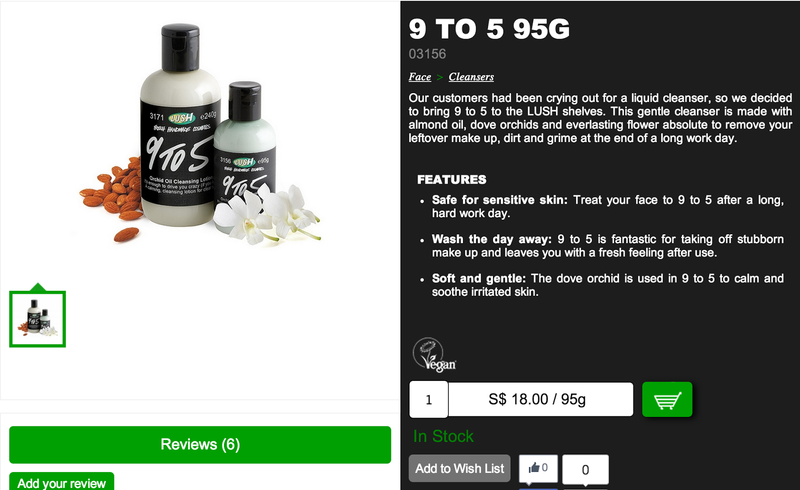 1 comment on "[ADVERTORIAL] Lush 9 to 5 Cleanser"